Di nuovo con coraggio. Il nuovo Acer ultra sottile da 15" Predator Triton 700 gaming non è niente di innovativo. Oltre alla tastiera meccanica, l'insolita posizione ed il design del touchpad possono dare un look interessante. Riuscirà il Triton 700 con il suo elegante case ed una GTX 1080 Max-Q a contrastare l'Asus ROG Zephyrus? Predator Triton 700 affascina, sotto molti punti di vista. Affascina con lo stile, con il design, con il bel display a 120Hz, con la velocità della GPU NVIDIA, ed anche con certe soluzioni originali, come la tastiera meccanica (una chicca!) ed il touchpad arretrato e trasparente (per fortuna è incluso un mouse!). Affascina così tanto che possiamo anche perdonargli un'autonomia sottotono (tanto dobbiamo giocarci, non andarci a giro), ma il vero scoglio è rappresentato dal prezzo. Se supererete quello, il resto è in discesa. La scheda video, NVIDIA GeForce GTX 1080 Max Q offre prestazioni altamente sorprendenti, specialmente pensando alle dimensioni del portatile, che risultano ampiamente soddisfacenti per giocare tutto il 2018 alla massima qualità grafica disponibile, e ottenere valori molto buoni anche su schermi esterni a risoluzioni 4K. Acer ha assemblato un prodotto sicuramente ottimo sulla carta: tanta potenza e form factor da primi in classifica. Come gli altri notebook della stessa categoria il prezzo di partenza è alto, 3399,00 Euro, andando a escludere la maggior parte dei videogiocatori. I pro sono assolutamente la dimensione, il sistema di raffreddamento e i componenti scelti e meriterebbe un voto più alto se non fosse per l'infelice soluzione del touchpad. Anche se può essere visto come difetto secondario, in questa fascia di prezzo si collocano pochissimi compratori e principalmente si tratta di videogiocatori che sfrutteranno il portatile come main PC, e avere un portatile-non-portatile non è un problema da poco. As a proof of concept, the Acer Predator Triton 700 has me very excited for the future of gaming. A slim, slick laptop with the power to show a gaming PC who’s the boss was only a pipe dream till this device came along. Having said all that, the Triton 700 is still one of the rare few notebooks that offer desktop-grade performance in a truly slim and light form factor. With laptops like this and the ROG Zephyrus on the market, gamers now have more choice than ever before. That for me is a real shame, as the rest of the laptop is very, very good – the powerful hardware in such a slim chassis is very appealing. Hopefully Acer can release an updated model in the future that would get the score this laptop deserves. Acer got a lot of things right with the Predator Triton 700. The build quality is solid, there’s – relatively – adequate battery life, and it managed to avoid leaving a giant gap on the bottom. There are also no disappointing elements in terms of hardware. But like the ROG Zephyrus, there is quite a premium to pay for the power you get in such a slim chassis; at RM13,999, you could get laptops with a similar set of hardware for less. The Predator Triton 700 is also really good value when you consider the competition. This top-spec model is priced at RM13,999 and if you compare it to the ASUS ROG Zephyrus GX501 — currently the Predator’s closest competitor — the Triton 700 is RM2,000 cheaper. There’s even a more affordable variant that’s priced at RM9,999 but it loses the 120Hz screen, drops GPU to a GTX 1060, RAM to 16GB and storage to 256GB (128GB+128GB in RAID 0). What ACER’s Predator Triton 700 lacks in elegance and design chops, it makes up for in performance. ACER took the idea of a thin-and-light gaming machine and ran with it, stuffing the notebook with the very best components and hardware currently available to make a monstrous gaming PC. While it’s significantly more expensive than other Max-Q notebooks in the market today, the added hardware and performance bump is worth it if you have a lot of money to burn. You pay big-time for the Triton 700’s mobility, though. If you don’t mind massive desktop replacements, the 17-inch Alienware 17 R4 packs a more potent, full-fat GTX 1080 with a higher-resolution 2560x1440 G-Sync display for about $2,550 on Dell.com. The Alienware’s processor also outpunches the Triton 700’s. Yet it’s almost twice as heavy at a staggering 9 pounds, 12 ounces. Pick your poison. But for the first time ever, gamers on the go have some choices. The Acer Predator Triton 700 ($3,000 on Amazon) is one of the most impressive gaming laptops ever created, full stop. Every inch of this rig oozes quality, from the sleek, slim aluminum chassis to the fantastic mechanical keyboard to the no-compromises gaming experience provided by the GTX 1080 Max-Q and its accompanying 120Hz G-Sync display. And that doesn’t even take into account that it was literally impossible to cram this much power into a laptop this thin until very recently. There’s a lot to drool over here. Thanks to Nvidia's new Max-Q graphics technology, the Acer Predator Triton 700 offers a good mix of graphics performance and weight savings, but its competitors do better. The Acer Triton 700 is an impressive slim gaming laptop, but its nontraditional touchpad makes it a tough sell for anything other than games. The Acer Predator Triton 700 fuses cutting-edge notebook design with the latest in gaming technology. The GeForce GTX 1080 Max-Q graphics chip in our review unit was an impressive performer, approaching or exceeding triple-digit average framerates in the games we tested. Thanks to the 120Hz G-Sync display on this notebook, you can actually utilize most of that performance—provided your eyeballs can actually register such high frame rates. That said, keep in mind the Max-Q graphics chip isn’t as fast as a standard GTX 1080. In our benchmarks, a standard GTX 1070 performed similarly to the GTX 1080 Max-Q. We’re not necessarily complaining, as the Triton 700 still provided more performance than we’d previously seen in this form factor. The Acer Predator Triton 700 delivers the power of a full-on desktop replacement in the body of a stylish, portable mainstream laptop. Ridiculously powerful and impressively thin, the Predator Triton 700 has no problems taking what you throw at it, but it gets almost too hot to touch under load and lacks features that key competitors offer for less. Here’s the bad news: ACER is pricing the Predator Triton 700 at Php 229,999, which is considerably more than the offering of their rival. Then again, you’re getting a lot more PC for the price, along with several freebies, namely a Predator Cestus Gaming Mouse 500, a Predator Galea 500 gaming headset along with 5K worth of Steam credits. 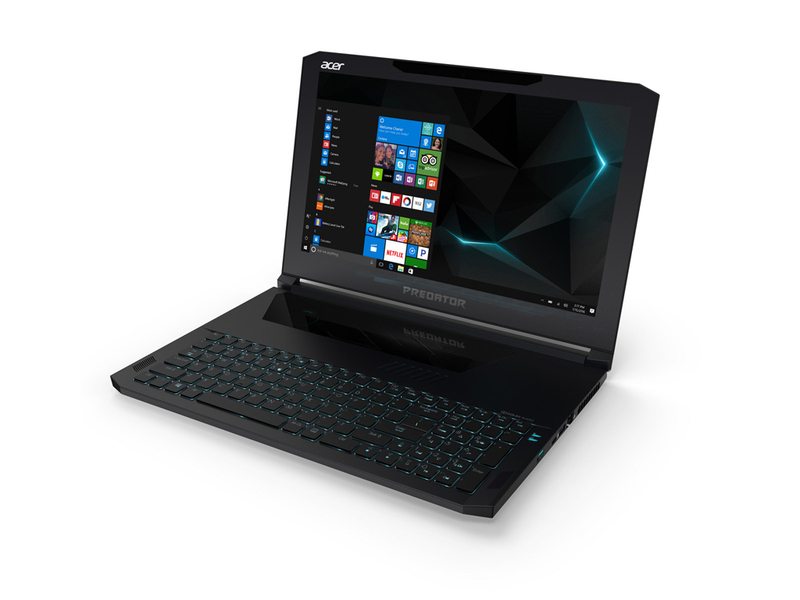 If that price is a little steep for you, ACER will also be selling a version of the Triton 700 with a regular NVIDIA GTX 1060 inside paired with a 15.6-inch full HD 60Hz panel with 16GB of RAM, 512GB SSD storage and the same Intel Core i7 processor for more than half the price of the full-fledged version, at Php 134,999. Acer Predator Triton 700 preview: A gaming great is born? And how much cash will you need to part with to buy a Predator Triton 700? €3,399 when it goes on sale in August. There's no distinctive UK price, but given the current climes we wouldn't be surprised if it was also around the £3,000-£3,500 mark (spec depending). It is genuinely powerful, too, thanks to high-end components and the cooling system to keep them running at their highest possible speeds. Gaming won't be a problem, and that keyboard is among the best we've tried in a laptop. Razer still has the edge right now, but Acer has something special here. Scheda grafica high end ad efficienza energetica con 8 GB di GDDR5X-VRAM che si basa sul chip Pascal GP104. Monta 2560 unità shader ed offre circa il 10-15% di performance in meno rispetto ad una normale GTX 1080 a causa dei clocks inferiori, ma il consumo energetico è molto più basso in cambio. 2.39 kg: Questo è il tipico peso del portatili con diagonale del display da 14-16”. 78.38%: Il punteggio ottenuto non convince. Bisogna considerare che difficilmente altri portatili hanno ricevuto un punteggio inferiore al 60%. Questo portatile è stato giudicato sotto la media, pertanto non possiamo consigliarne l'acquisto.